We have taken to calling them Salon Sundays. These are the Sunday afternoon events that include the Writing for Social Change reading series and special events like the launch of Joy Kogawa: Essays on Her Work which took place on November 20th. Edited by Sheena Wilson and published by Guernica Press, the collection of essays is written by scholars for the most part, but includes a wonderful piece by Ann-Marie Metten which documents the community effort that saved Kogawa House from demolition. This is first-hand cultural history as it is rarely written, describing how quirks of fate, and pie-in-the-sky determination sometimes get unlikely things to happen. It’s the story of an idea taking hold, moving a network of people to raise the funds to buy the house, but also unleashing the energy to turn the aging Vancouver Special in something that is truly special — Kogawa House. Ann-Marie who lives around the corner was an early supporter and now executive director. As I travel around the neighbourhood, I have conversations with people about the House. At the TD Canada Trust on the corner and the Marpole Public Library down the street I put up posters and chat to the tellers and librarians. Many know the House is there but have not been to any of the events. Ann-Marie comes up with an idea — well, actually an easel which makes an excellent bulletin board with a few adaptations: a thick plastic sleeve to protect the posters from the rain, and a couple of industrial strength clips to secure it. This contraption we set up on the sidewalk under the cedar tree. At first I worried it would be stolen. Then I started checking in on it every so often just to see who might have stopped to look. That led to more serendipitous conversations. And the odd knock at the front door, and a request for a visit. The best day for meeting neighbours, and my absolute favourite duty as writer -in-residence, was Hallowe’en. Ann-Marie arrived on the doorstep around 5pm with a little pumpkin, candle inside, sporting a vicious smile. She even supplied the bag full of candy. I expected some trick-or-treaters would know about the House, or the ailing cherry tree in the back lane. But I discovered most of them did! “Yes, Naomi’s Tree lives here.” Older ones knew about Obasan. And the cherry tree? Last Spring, volunteers orchestrated a yarn bombing, and with the help of the Fire Department’s hook and ladder truck affixed its branches with an array of permanent woollen blossoms. The tree seems to be improving, and it’s now in bloom year round. Tara Beagan arrived on the redeye from Toronto on Sunday morning, Native Earth’s annual playwrights’ workshop Weekesageechak Begins to Dance having concluded its 22th season the night before. A two week intensive collaboration between playwrights, choreographers, actors, directors and dramaturge, Weesageechak always ends with public “readings” of the new work. Well readings that are usually blocked out performances, and the actors often know their lines. It was at Weesageechak that I first saw Dreary and Izzy, Tara’s play about sister love and loyalty across race, adoption and the ravages of foetal alcohol syndrome. The play went on to full production at Factory Studio Theatre in Toronto, and even before it opened the response from one corner of the Aboriginal community was to demand it be closed. The objection? Beagan was stereotyping the Aboriginal community by associating it with FAS. The show went on. And Tara talked to us about being shocked herself when she learned about FAS. Despite its widespread effects, like many, she had had no idea. It was her sister, a schoolteacher in Alberta, who first described its effects to her, and this was the inspiration for Izzy, the adopted Native sister, and her younger “elder” sister Dreary. The excerpt we read – I did the lines of Mrs. Harper, the white neighbour, and Tara did all the other voices – described the horror of newborns on withdrawal, as well as the grace in children like Izzy not understanding what they’ve lost. At the heart of the play is the relationship of the two sisters, characters who rise to the occasion, defying stereotype. In short, keep an eye open for Native theatre/performance going on near you. Don’t think that it’s only for Aboriginal audiences. Shortly after I arrived at Kogawa House, artist Laura Bucci came for an evening session of button making. She arrived with several plastic packing boxes filled with an array of coloured and patterned paper, old magazines, scissors, glue, and a collection of rubber stamps with words like “escape” and “passion” on them. The event was part of Word on the Street, which expanded this year to three days over the weekend, and to off the traditional site at the Central Library to community venues like Kogawa House. We set up a table in the living room and over the evening about twenty-five people set to creating their own “designer” buttons. The best part, naturally, was the moment you got to slip your creation onto its metal backing with Laura’s neat little hand-press, and pop out the result. That evening I also met Howe Chan. Howe contacted me last November just after I returned from China. I’d been to Taishan, the county in Guangdong which many Chinese Canadians came from, looking for the story of a head tax payer named Wong Dong Wong who left China for Canada in 1911. The Saturday before I left for Beijing, Sing Tao published a front page story about my search. Howe, who happened to be in Taishan himself at the time, saw the story when he returned home, got his daughter Jennifer to sleauth down my phone number, and called me up. “If only I’d known,” were practically his first words. “I was there in Taishan right at the same time, and could have taken you to his village.” My own visit had yielded the fact that Mr. Wong was an orphan whose father died the same month he was born in 1895, and his mother a few months later. 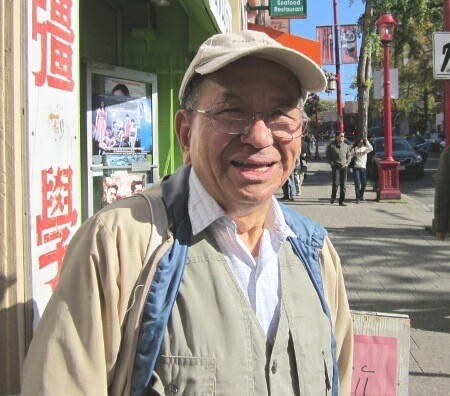 Mr. Wong was brought to Gold Mountain by an uncle to work in the business he was setting up with two others in South Vancouver. Howe grew up in a village very close to Wing Ning where Mr. Wong was born, and knows it well. As a boy he often fished in the river that runs in front of it, and remembers going there at lunar New Year with his mother to see Cantonese opera. I began sending Howe copies of material I’d gathered. The official Wong family tree from the Bureau of Overseas Chinese and Foreign Affairs, and the family’s own handwritten genealogy that dates back to the 1870s shown to me by the grandson of Wong Wanshen, the uncle who sponsored Mr. Wong. In return Howe sent me copies of histories he written about the Chen family, and montages of photos and maps of Taishan with detailed notations written in a very precise and clear hand. Howe does not do computers, so over the year we sent stuff back and forth through the mail, and had long conversations on the phone. Howe is now my chief advisor on all things to do with Shui Doi – the name of Wing Ning in the local dialect. But since meeting him in person and getting to know him, I have also heard more about his story, and the hardship of his mother in particular. Separated from her husband for decades she was forced to live out her life alone in China. For in 1946, despairing of ever reuniting, Howe’s father had married in Canada. The very next year the exclusion laws were lifted. Today, Howe leaves for another trip back to his village. He’s undertaken to visit Shui Doi and to see what else he can find out about Mr. Wong. By this time, too, he has discovered his own connection to Wong`s story. There in the family tree he discovered his own mother,a cousin of my Mr. Wong, five times removed but in the same generation. I’ve always been aware that Canada is a small country. I didn’t realize that China, in some ways, is a small place, too. Poet. author and editor, Besty Warland has been writing on the cutting edge of feminist literature, and active in the feminist writing community for thirty years. Her poetry, and latterly her non-fiction, push the boundaries of genre and challenge the assumptions of culture. A mentor to many, Betsy is currently director of the Writer’s Studio at SFU. Sunday, November 6th. Sheena Wilson launches her collection of essays on the life and work of Joy Kogawa, Joy Kogawa, Essays on Her Works (Guernica). Wilson has contributed three articles and an extensive Kogawa bibliography to the book. Several of the writers will be present, as will Joy Kogawa. Sunday, November 20th. Maliseet visual artist and writer Shirley Bear is from Tobique, New Brunswick. Her work is in many collections and in 2009 the Beaverbrook Art Gallery mounted a retrospective of her work. She is who also a writer who blurs the genres, and her book Virgin Bones – Belayak Kcikug’nas’ikn’ug, combines story, poetry, and prose. Shirley lived in Vancouver through the 1990s and was the Aboriginal Advisor at Emily Carr College. Sunday, December 4th. 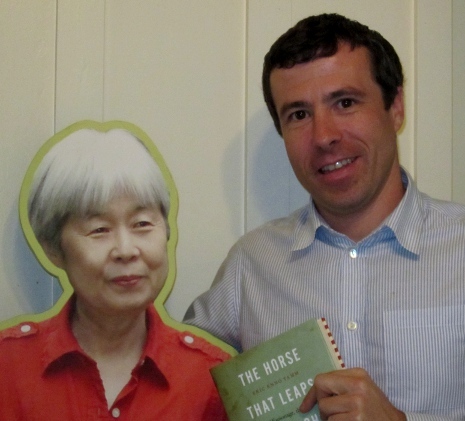 A tradition at Kogawa House is the reading series Writing for Social Change. This year I have invited six writers to join me in what once was the Kogawa family living room, to read and talk about their writing. I have not restricted myself to non-fiction, as I find writers working with documentary — actual characters and real events — in all sorts of genres. 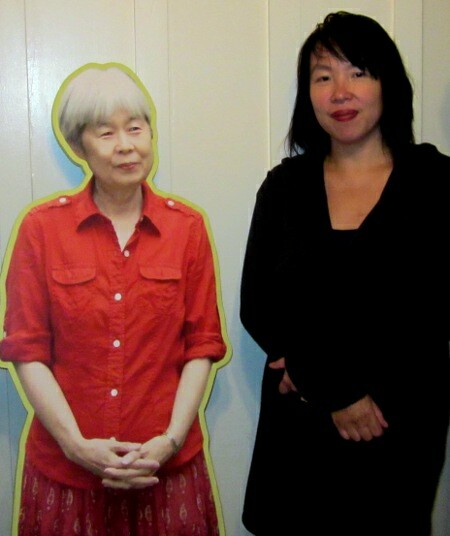 I began with poet Evelyn Lau whom I first heard about in the late 1980s. I was on a train returning to Toronto from Ottawa after an appearance with other artists at a public session on cultural policy, sitting beside the representative of the Canadian Authors’ Association. Not yet brain-dead after a long day of talk, we chatted about our writing projects and the books we were reading. He waxed on with great enthusiasm about a very young writer who’d written a book about her life after walking out on her parents at the age of fourteen to live on the streets. He was going to ensure her book was published. The man was Fred Kerner to whom Evelyn dedicated her book, and Runaway: Diary of a Street Kid was the bestseller that launched her career. She followed that with You Are Not Who You Claim which won the Milton Acorn Peoples’ Poetry Award given to courageous writers who, like Milton, challenge mainstream complacence. Two years later, in 1992, Oedipal Dreams was nominated for a Governor General’s Award making Evelyn the youngest nominée in the award’s history. And since then she has continued to push limits, court controversy, and to write stunning poetry. I have always liked listening to artists in conversation with other artists; ever since I heard (and met!) James Baldwin in conversation with a small audience at a local bookstore when I was living in Italy in the sixties. So the readings I host are conversations, too. Evelyn read mostly from her 2010 collection Living Under Plastic, a title referring to Vancouver’s infamous leaky condos. These poems are about urban life, about death (her father, an aunt, several friends), about shopping malls, leaking buildings, and probably the trippiest poem you’ll ever read about mosquitoes. Seriously. In between “sets” of readings, we chatted back and forth, and others leapt in with questions and comments. We discussed the sense of time in the writing of poetry versus prose, the business of writing about others, and what happens when you cross a boundary and make mistakes. Evelyn had a few tough questions for me on that one. So it was a great afternoon! This Saturday, October 22nd, Vancouver Mayor, Gregor Robertson will welcome Evelyn as the City’s Third Poet Laureate. I moved into Kogawa House (pictured above) on September 15 and that evening a group of volunteers and friends of Kogawa House showed up for dinner. Bringing dinner with them! There to welcome me to Vancouver and the Marpole neighbourhood. What has changed about Vancouver since my last long stay? All the indie bookstores I knew and haunted are gone, save the venerable Macleod’s Book down on Pender Street and Banyen Books in Kitsilano. Ditto the video rental places I used — Alpha Video on the Drive and even Videomatica. Old familiar mainstays I am glad to see again:the Kitchen Corner stores, Famous Foods, and 3 Vets where you can still get enamelware basins, dishes and pots. But right now the Vancouver Film Festival is playing, and later in October the annual Heart of the City Festival takes place in the Downtown Eastside. This is one of my favourite places in Vancouver, actually. Not only because of the memory of the famous fish place called The Only which was located on Hastings near the Carnegie Centre at Main, but because of Chinatown and Strathcona and the vibrant arts community there. The Heart of the City Festival grew out of that, and my friend Terry Hunter’s Vancouver Moving Theatre which has been operating there for twenty years or more. The downtown eastside is not what you read about in the papers. Yes, there are poor and troubled folks living there, but it is a community and it works. 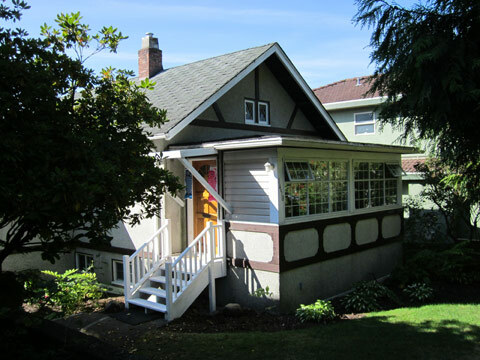 In mid-September I began a three month residency at the family home of Joy Kogawa in Vancouver. Joy is a colleague and friend. We have both been active in the Writers’ Union, and we often meet on picket lines and rallies, at the St. Lawrence Market Book Fair or Word on the Street. I well remember the year Joy brought the issue of Japanese redress to the annual meeting of the Union which I am proud to say passed a motion supporting the movement and calling on the government to accede to the demand for acknowledgment and redress. Some of the arguments pointed out that in addition to the economic, physical and psychological trauma, there was cultural damage inflicted by internment. And that this included the loss to all Canadians of the contributions many talented people, including writers, might have made but for the massive disruption to family life, community and education. It’s a privilege for any writer to be given time and a place to write. The big bonus of being asked to do that at Kogawa House is the house itself which comes with a community. And with a mission — that being for us all to be mindful of the embedded injustices that still exist in Canadian society. For starters, I’ll be hosting the Writing for Social Change reading series, speaking with writers who are actively engaged in community, whose work crosses cultures and assumes difference. We’ll be announcing the line-up soon. Meanwhile….check out Historic Joy Kogawa House at www.kogawahouse.com.